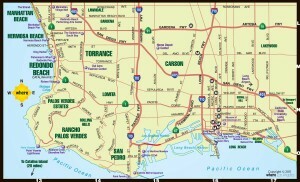 Navigating Your Way With an LA Map, GPS in Los Angeles is helpful indeed. If you’ve never been to LA before and are planning a trip, be sure to pack a current LA map to have on hand in your rental car. Most car rental agencies will provide you with a rudimentary map of Los Angeles, but they tend to be broad stroke snapshots of the major freeways vs. a reliable grid with street names and area landmarks. Some people have been foregoing maps all together in favor of using their mobile devices to navigate, but there’s nothing like a good, old fashioned map to get a sense of the city itself, which is spread out across a diverse topography (and is never interrupted by a phone call or text message). Truly, a great map can be one of your best traffic resources when it comes to surviving LA! For example, it might be helpful to know that the 405 North is closer to the ocean than the 101 Freeway, or that the popular walk of fame is not in downtown LA (as some might assume) but in Hollywood. Most gas stations will carry a current map of the area and so will any AAA location. 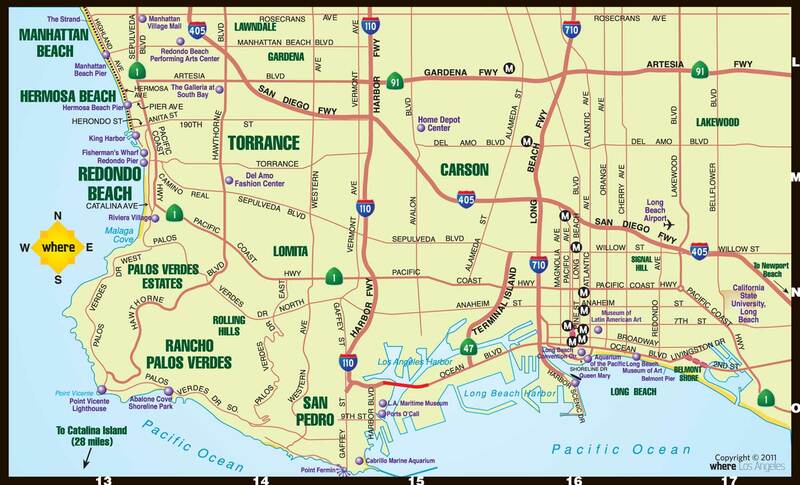 If you’re a AAA member, why not pick up your map of Southern California before you get on the plane? This way, you won’t get lost trying to find your way. To truly understand an LA map, you first need to understand LA neighborhoods. Otherwise your map is little more than a meaningless grid connected by highways. It’s the neighborhoods that give the map meaning, where you can truly understand the culture of LA. The Atwater District is family friendly. There are plenty of moms and dads, but their strollers are outfitted with hip hop bopping HiFi stereo speakers. It’s a cool place to raise a family without being totally square and boring. Beverly Hills is just what you’d expect, a place for movie stars. Highland Park is a great hangout for comics. Highland Park is also accessible by the Metro Gold Line, which has drop offs all across Figueroa St. Inhabited by various ethnic groups, there’s a variety of restaurants that cater to that community such as Salvadorian & Mexican, Italian (since 1968) and rated for the best hot wings in LA, The Greyhound. Silverlake is still as hip as can be, and caters to a family friendly and LGBTQ community. East Hollywood should be re-named to “Little Thai-Menia” since its home to Little Armenia and Thai Town. Some of the best pad thai and jade noodles can really go hand-in-hand with Zankou Chicken. Chinatown is a top tourist destination in LA but has been recognized as a historical community of Los Angeles, which means original monuments and markets galore. Boyle Heights begins East of the LA River and can be identified by the historic Mariachi Plaza where Mexican roots are deeply engraved. The Miracle Mile is filled with museums and is walking distance to great meals and finds at the Original LA Farmers Market. Los Feliz is home to Hollywood celebrities, musicians, actors and movie producers in their multi-million dollar mansions. Just above Los Feliz, find the most beautiful LA hiking trails while visiting Griffith Park. Depending on the trail, there are breathtaking views of the Los Angeles skyline to the south, Santa Monica and the Pacific Ocean to the West (on a clear day), Glendale to the East and the San Fernando Valley to the North. What’s your take on the LA Map? Thanks to technology, we’re able to have guidance from a digital map whenever we want it. Although maps are super helpful to us here at So Cal Pulse, others still have trouble reading maps and directions on their phones or on paper. When you’re on vacation in Los Angeles, it can be tricky to navigate through a city known for the worst traffic in America. Without further ado, we can help you find shortcuts through the LA Map. Street parking in Los Angeles is a huge task on its own. Believe it or not, locals in Los Angeles still get a few parking tickets each year despite living in the same area for decades. Make sure your hotel or place of stay has private parking for your rental car. There’s definitely a risk in getting towed in the middle of the night if you stay in Downtown LA or other major, busy communities with busy streets. Also known as the “Anti Gridlock Zone,” this can cause you a car tow in a matter of minutes. When in doubt, check out this helpful site: Can I park there? Most people who haven’t spent a lot of time in LA are surprised to find how diverse and complex the city actually is. Standing atop the Griffith Park Observatory, which offers breathtaking views of the city and the Pacific Ocean, one begins to get a sense of how spread out the mini-cities are from each other. Finding your way can be complicated, so be sure to stop at your local AAA office and get an updated LA map, and give yourself time to reach your destination. LA is not only famous for its celebrities, but for its seemingly endless traffic. Avoid long trips at rush hour (7-10am and 4-7pm).